Fire officials determined the cause of the Whitsell Manufacturing plant fire was accidental. The facility went up in flames over Memorial Day weekend and burned for days. Fire investigators were unable to determine the exact cause of the blaze that burned the Whitsell Manufacturing plant in Saginaw, OR, over Memorial Day Weekend. Investigators did say, however, they have ruled the cause of the fire at the wood mill was accidental. The fire, which overwhelmed the fire suppression system, ended up driven by wind and fueled by sawdust and wood on site. South Lane Fire and Rescue worked with Oregon State Fire Marshals Office, Oregon State Police, and the Bureau of Alcohol, Tobacco, Firearms and Explosives on the investigation. Winds out of the northeast fanned the flames through an open door on the north end of the building. South Lane Fire crews responded the scene May 27 and remained on site cooling the flames and investigating through May 30. 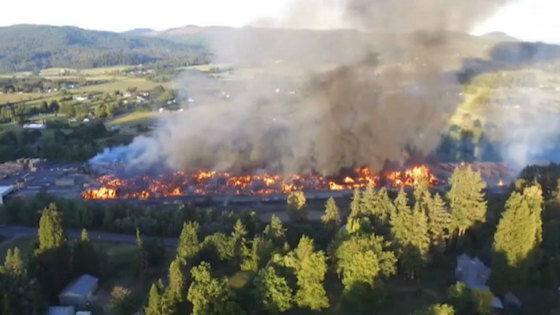 The State of Oregon is working to help the mill owner and the 80 employees displaced by the fire. The mill’s owner has indicated there are plans to rebuild.